Back cover blurb: The first in a nail-shredding new crime series. Fans of M.J. Arlidge will be gripped from start to finish. On a remote Highland mountain, the body of Elaine Buxton is burning. All that will be left to identify the respected lawyer are her teeth and a fragment of clothing. In the concealed back room of a house in Edinburgh, the real Elaine Buxton screams into the darkness. Detective Inspector Luc Callanach has barely set foot in his new office when Elaine’s missing persons case is escalated to a murder investigation. Having left behind a promising career at Interpol, he’s eager to prove himself to his new team. But Edinburgh, he discovers, is a long way from Lyon, and Elaine’s killer has covered his tracks with meticulous care. It’s not long before another successful woman is abducted from her doorstep, and Callanach finds himself in a race against the clock. Or so he believes … The real fate of the women will prove more twisted than he could have ever imagined. Perfect Remains is a novel that has a very dramatic opening. Now for me as a reader that means the novel could go one of two ways. The opening could be the best part of the book, and the rest a disappointment, or it could be the beginning of a brilliant novel. Thankfully Perfect Remains falls into the latter category. Detective Inspector Luc Callanach is a new face in Edinburgh, having left behind a job at Interpol and his life in Lyon to move to Scotland. Luc is handsome, enigmatic and determined to get justice for victims of any crime - I think I might be a little bit in love with him! Elaine Buxton is missing, feared dead when Luc joins the force in Scotland, quickly his investigation turns from missing person to murder when a body is found on a remote highland mountain. DI Callanach is with his team and the body, when another woman is reported missing. Quickly they return to the City and set out to uncover what kind of depraved individual is terrorising the streets of Edinburgh. But it takes another body and another missing woman to bring them anywhere near anyone resembling a suspect. And even then they have very little to work on. But they must work quickly to avoid yet another body. Without giving anymore away, Perfect Remains is a rarity in crime novels as the reader learns the killers identity early in the novel, but this only adds to the tension in this particular novel. 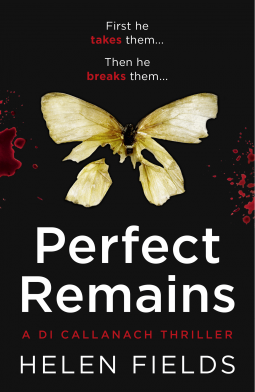 Perfect Remains is the first in a series of DI Callanach books and I am so looking forward to the next in the series. Perfect Remains is available now via Amazon online and all good book shops. Thank You to the publisher who approved my request via netgalley in exchange for an honest review.